The Dead Rabbit Grocery & Grog in lower Manhattan has won every cocktail award there is to win, including being named "Best Bar in the World" in 2016. 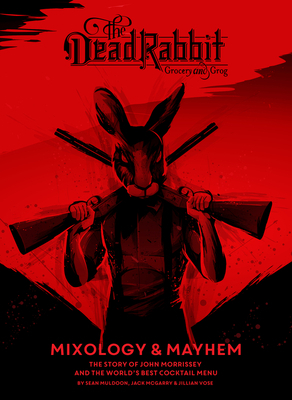 Since their award-winning cocktail book The Dead Rabbit Drinks Manual was published in 2015, founders Sean Muldoon and Jack McGarry, along with bar manager Jillian Vose, have completely revamped the bar's menus in a bold, graphic novel style, now featured in their newest collection The Dead Rabbit Mixology & Mayhem. Based on "Gangs of New York"-era tales retold with modern personalities from the bar world (including the authors) portrayed as the heroes and villains of the story, the menus are highly sought-after works of art. This stunning new book, featuring 90 cocktail recipes, fleshes out the tall tales even further in a collectible hardcover edition—making it a must-have for the bar's passionate fans who line up every night of the week. SEAN MULDOON is the cofounder and managing partner of the Dead Rabbit Grocery and Grog in New York City, and formerly the bar manager of the Merchant Hotel in Belfast. The Merchant was declared “World’s Best Cocktail Bar” in 2010 at Tales of the Cocktail, and the Dead Rabbit won three awards at Tales of the Cocktail 2013, including “World’s Best New Cocktail Bar.” In 2014, the Dead Rabbit won two further awards at the event, including “Best American Cocktail Bar.” The Dead Rabbit is the expression of Sean’s lifelong dream to combine sophisticated cocktail service with the rich tradition of the Anglo-Hibernian pub. "In this excellent and unique cocktail book, Muldoon and McGarry, founders of New York City’s Dead Rabbit lounge (along with Vose, their bar manager), offer the establishment’s complete menu—a six-part, serialized graphic novel, with an additional 100 intricate craft cocktails. The darkly drawn protagonist, known as the Rabbit, is a “hybrid man-rabbit anti-hero” with a sinewy human torso and scary bunny head. Channeling John Morrissey, the leader of the 1850s Irish gang, the Dead Rabbits, but lurking in the shadows of Hell’s Kitchen, circa 1978, he drinks, gambles, and settles scores with a ruthless vengeance… [a] one-of-a-kind collection."